"Before owning my business, I was a stone mason/conservator. I still work in this field but I now run a business of my own. I have wanted to produce speakers since using sound in art installations while at college in Falmouth. I have a background in Fine Arts at Falmouth University, where I was awarded a BA hons degree in the subject. Both aspects being a really big part of my life, I wanted to combine my interests in sculpture, design and audio. 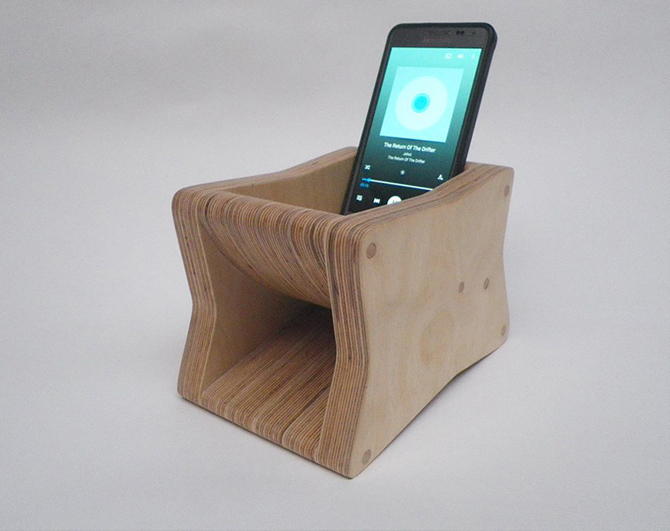 Designing and developing speaker systems is a complex process, but the versatility of CNC has allowed me to make and sell other items which has allowed me to develop and experiment with new ideas." "I discovered CNC machining while at Falmouth University while I was researching methods of cutting materials with a view to producing complex designs for installations which combined sound and sculpture. I have an interest in modular systems, so CNC seemed like the perfect method to produce pieces with consistent accuracy which is quite important when dealing with audio engineering." "Once discovering the world of CNC machining was the way forward for his career, Aaron needed the hardware and software..."
"I currently use a British made, flatbed, rack and pinion, 3 axis CNC machine with a cutting area of 1220 x 2440. The only modification I've made is to replace the original MDF bed with a 44mm thick 1220 x 2440mm fire door blank. This has improved the accuracy of the machine with regards to cutting depth." "At the moment I am using Vectric VCarve Pro. I researched various packages and downloaded a number of free demos and found VCarve to have the best interface in terms of intuitive ease of use, features and support. The tutorial videos were a great help. I found VCarve really straightforward from the beginning and with the tutorial guides I was designing, cutting and making in no time at all. The interface is really well designed and the features allow for a really flexible approach to drawing up designs. I found I could get the results I wanted very early on. As my experience with VCarve has grown, I've found that there really is no end to what can be achieved and it allows me to use unconventional approaches to design and manufacture which helps to make the things I produce unique. This in turn makes them stand out when compared to other products." "Now that Aaron has told us all about his equipment, his knowledge and passions its time he talked us through his amazingly sleek project. He starts off by telling us why he decided to make it..."
I wanted a better alternative to using a salad bowl as a passive amplifier for my mobile phone when I was in the kitchen. I looked around online and saw lots of great designs for passive phone amplifiers and made some prototypes using some ideas taken from these designs. I also wanted to make something that could be nested into the areas of waste that occur when producing larger pieces. This was a side project and was completed over a few weeks in between other jobs. I made quite a few modifications to the initial design in order to improve functionality and increase amplification. 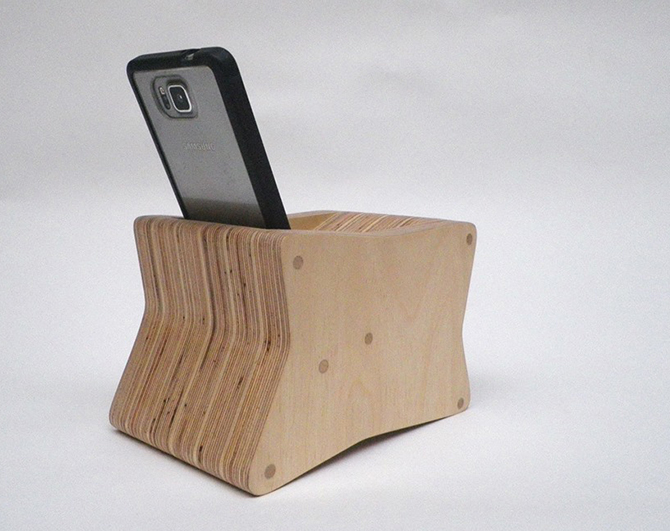 "I used birch plywood and beech dowels sourced from a local timber merchant. I used a 6mm TC 2 flute straight bit for the dowel holes and cutting out so that I didn't have to change tools and could use a merged toolpath: 6 passes with 1200mm per min feed rate, 18,000 rpm spindle speed." Like I said this project was intended to be created from off cuts I had laying around so that material wouldn't get wasted. With this in mind the 'Nesting' and 'Merge Toolpaths' features were gold dust. Nesting allowed me to automatically fit all my parts into the measured spaces I had left in the offcuts without having to fit them all in a space manually in the software. And the merge toolpaths saved time because I didn't have to change tool bits so the CNC ran them continuously without break. "The design and build of a project is always enjoyable in a way, although it can be frustrating at times." "However, what I enjoy most is actually putting the objects which I have made to use, especially when they work as hoped." "What worked really well was the simplicity of the design, both in terms of function and the overall look of the finished object. It is made from only three different forms. I also like that the practical aspect of being able to see and access the whole screen and that the feature which allows this access also acts as a sort of 'half horn' which adds to the amplification of sound." "There's not much that I would change about the design - I'm not sure, maybe use different wood for the dowels or different materials and colours. I would also look at using thicker dowel so that I could use cutters of a larger diameter to speed up machining. One advantage of having the visible dowels which run all the way through is that during assembly when gluing the pieces together the holes can be used to pass threaded bar through. Using blocks which the bar also passes through and wing nuts at both ends of the bar, the nuts can be tightened in order to clamp the pieces together. This also makes aligning the pieces much easier as it can be done in increments." "It's amazing what you can create when your combining your passion and knowledge with offcuts of wood, a CNC machine and a creative mind, and Aaron is testament to that. To end the conversation, we asked Aaron what his future plans are... "
"At the moment I am working on several projects, a modular shelving commission, a couple of speaker builds, a lighting project and a modular building system. I am currently working on a long-term project to create a flexible modular building system, sort of Lego meets Meccano." We would like to take this opportunity to thank Aaron Leedham for giving up time from his busy schedule to tell us about this work and projects.